Part of our American heritage is that we celebrate the hero who stands his ground alone: the Lone Ranger, Superman etc. I am a Louis L’Amour fan. The hero always wins the day against the bad guys. Usually he wins by himself against overwhelming odds. It’s the American Dream. Frank Sinatra characterizes America best when he sang the song, “I did it my way”. But this “Raise ourselves up by our own bootstraps.” mentality is not a Christian value. While there are times we must be willing to sacrifice alone, the Bible calls us to work together as a team. Jesus calls that team “the church”. We are better together. I was reading this morning in Luke 10 that Jesus sent 72 disciples out… two by two. When they ministered, they didn’t do it alone. They had someone to lean on. When one was down, the other could pick him up. Strengths and weaknesses are shared as they did ministry in Jesus’ name together. They learned together, laughed together, cried together and shared everything in common. Paul was very upset when young John Mark abandoned him. The early church advanced the kingdom together. In Acts we read about Paul and Timothy, Paul and Barnabas, Paul and Silas, etc. Why do we try to tackle ministry alone? We need each other. It is a great thing that we will be together again at Minister and Mates Retreat. We look forward to worship and great preaching. But it will also be great to be together sharing life. I hope, if you are able to attend, that you will come with open heart and a willingness to make new friends. I hope that it will be a time of renewing old friendships and a time of mutual encouragement. If you are not able to attend, know that you will be missed. We value your participation and look forward to the next time that we are able to gather together on our great district. In the mean time, let’s be intentional about gathering informally and formally at zone meetings and district training events. Let’s covenant to continue to be a district that does ministry in Christ’s name together. I am pleased to announce that Nick and Kylie Jo Smith have accepted a unanimous call to pastor the Plainville Church of the Nazarene. Nick and Kylie Jo come to us after serving at the Burden United Methodist Church. They are Wichita State graduates. Nick is currently enrolled at Nazarene Theological Seminary. They have a two-year-old named Isaiah and are expecting another child in early October. Let’s welcome them to our district and be in prayer for a healthy baby and a safe delivery. Be in prayer because you know expecting a little one, moving and transitioning to a new ministry assignment can be stressful. Welcome Nick and Kylie Jo! Jeff and Danielle Black have accepted the call to pastor our McPherson Church of the Nazarene. Jeff and Danielle grew up in our Hoisington Church. They graduated from MNU and most recently from NTS. The parsonage is in need of some attention. If your church would like to help with a Saturday workday in September, please let us know. Let’s welcome Jeff and Danielle to the district! In 2012, Pastor Christian Juarez began a successful soccer ministry which pulled kids off the streets, out of gangs and gave them a new start, a new family and a new life. Soccer ministries are spreading across Honduras and the church is growing. Join us as we travel to La Esperanza Puerto Cortes, Honduras, partnering with the local Nazarene church to build a soccer field and help reach the lost for Christ. I thank the Lord daily for our great Kansas team. Thank you to all who attended our District Assembly and contributed in so many ways. We have such great admiration for all of our great leaders. It was a great joy to celebrate all that God has done in and through us all this past year. We love partnering with you in making disciples in the nations. Donna and I would also like to thank you for your generous support of the vision and ministry of the Kansas District. We were overwhelmed with your generous love offering. Thank you!! As I reflect on a summer of ministry, I am grateful, also, for those who contribute and give of their time to make our camps a great success. We spent significant time at all of our camps this year. We are encouraged to see so many who care about the next generation and invest in the church of tomorrow. We have the best team of children’s ministers, youth pastors and lay leaders! I hope you begin now to plan to attend next year’s camps. Every Senior Pastor ought to invest in at least one of our camps, as this is one of the best ways to invest in the church of tomorrow. I want to encourage you to bring your youth leaders to our Next Gen meeting, which is coming up quickly. We will meet at Junction City Church of the Nazarene on Saturday, August 27, from 9 a.m. to 5 p.m. The cost is $15 per person. Register by emailing Jeremiah Wood at jeremiahwood@jcnaz.org or John Luce at jluce@sfnaz.com. Please be in prayer as our youth leaders meet to be equipped to reach our next generation for Jesus. While we are on the subject of reaching the next generation, I want to remind you to keep Nazarene Theological Seminary and Nazarene Bible College in your prayers. Not only do we want to pray for these great schools, but we need to remember to support them with our giving. I was encouraged at assembly when a generous Kansas Nazarene offered to match our giving to NTS and NBC up to $5,000! Wouldn’t it be great if all of our churches participated in giving to NTS and NBC and we met this goal? I encourage you to let your people know about these great schools and encourage them to support them through their giving. Please take at least one offering this year. I believe that if we all jump in and give we will exceed this goal. Our Minister and Mates Retreat is fast approaching! I am hearing that many are planning to attend. Please make every effort to join us at Horn Creek Resort near Westcliffe, Colorado. The attached brochure has all the information you need to sign up and attend this great weekend as we relax and recharge for the ministry God has called us to. WE NEED YOU THERE, as we are better together. If you need help finding pulpit supply so that you can be with us for retreat, please contact the district office. MNU is prepared to help us with their music groups, student leaders and professors to fill this need as well. I am also glad to report to you that Jeremy and Jenny Carr have accepted the call to be our new pastoral family in Smith Center, Kansas. Many of you may remember Jeremy and Jenny as they served as youth pastors in Junction City. They come to us after serving as Senior Pastor at Oak Cliff Church of the Nazarene in Oklahoma City. Let’s welcome them back to our team. "Discouragement is dissatisfaction with the past, distaste for the present, and distrust of the future. It is ingratitude for the blessings of yesterday, indifference to the opportunities of today, and insecurity regarding strength for tomorrow. It is unawareness of the presence of beauty, unconcern for the needs of our fellow man, and unbelief of the promises of old. It is impatience with time, immaturity of thought, and impoliteness to God." Don't be discouraged. Be encouraged. Praise God! Good things are happening across the Kansas District. It was great to meet with so many of our district license candidates and the Board of Ministerial Credentials. We had 75 leaders together in Wichita this past Saturday for our annual Ministry Assessment. We had four productive workshops on preaching, developing a discipleship plan, balancing a budget and answering the call. I heard many positives from the day. I want to offer special thanks to those who led our training seminars: Kevin McDonald, Jon Fillipi, Andy Heer and Dr. Randy Cloud. We alsowant to say thank you to “the smoking pastor”, Brent Van Hook, and Shepherd’s Fold for providing our wonderful smoked barbecue lunch. As we draw near to assembly, I am hearing reports of changed lives and new people coming to know Jesus as their Lord and Savior. We remember that Jesus said, “I have come to seek and save the lost.” Luke 19:10. While we look forwardto celebrating the numbers at District Assembly, every number represents a soul that is being discipled and growing in their faith. We also need to be encouraged that Jesus is the one who adds to our numbers those who are being saved. God asks us to be faithful to do what He has asked us to do. He is the one who is drawing all men to Himself as we lift Him up. He is the one who will add to our numbers daily those who are being saved. conversations.” If we will talk to people, get to know them and look for opportunities to share the love of Christ in word and deed, the conversions will happen. So let’s be faithful to reach people the way Christ reached people. 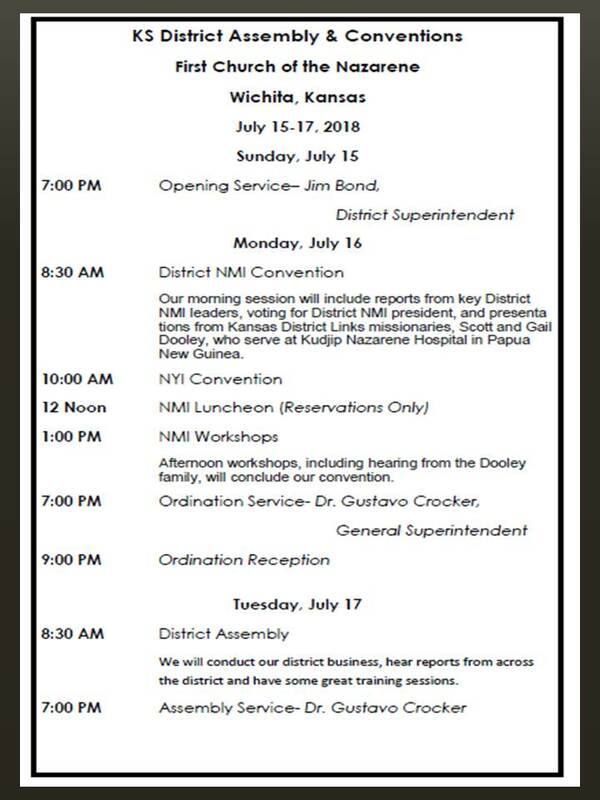 As we are preparing for our District Assembly, we look forward to the annual pastors’ report. We want to hear your story of faithfulness to the great commission. We want to hear a story ofchanged lives. Or perhaps you can share a ministry or a creative way you are reaching into the community beyond the walls of the church. We look forward to celebrating many of our new works and church plants from across the district. Also, as we prepare for District Assembly, please help us by being timely with filling out your annual reports. I remind you that we have a new District Secretary this year in Jay Bessmer. It will be helpful if you will get your reports in ASAP so that we will have time to put together the necessary information for budgeting and District Assembly reports. Please don’t wait until the lastminute. I am pleased to announce that Rev. Matt Lucas will be our new pastor at Woodland Lakes. His first Sunday will be May 29. Please keep the Lucas family and the Smith Center Church in your prayers as they transition from Smith Center to their new assignment in Wichita. The annual Kansas District Nazarene Missions International Convention unifies our churches. We come together to be inspired and encouraged - so that each delegate can be a catalyst in their church family as they carry out the Great Commission in their local communities. Exciting things are being planned for the 2016 Kansas District NMI Convention. Scott Rainey is our special guest speaker. He serves as missionary and field strategy coordinator for the Eurasia Region, in the C.I.S. (Commonwealth of Independent States). He will bring good news of what God is doing in his "neck of the woods"! Scott will speak during the morning session, during the luncheon and close our afternoon session. · We will be collecting CRISIS CARE KITS, SCHOOL PAL PAKS, JESUS FILM EVANGEHATS and EVANGEBRACELETS. See link below for Care Kit forms. · As an outreach to the Wichita community, we ask that each Convention attendee bring one can of non-perishable food (medium size - 14-16 oz) - canned vegetables or fruit. What an opportunity to show Christ's love with our neighbors! · Elections for Kansas delegates for the General Convention in 2017. · During the luncheon, we will watch an entertaining "Global Gameshow", featuring local NMI Presidents from across the District! · A number of afternoon workshops have been designed to educate, train, inspire and motivate each attendee how the Church of the Nazarene is sharing the Gospel in our communities and around the world. Workshop sessions will include training for NMI Presidents, up-to-date information on Work & Witness, World Evangelism Fund and more. There's exciting news to share, inspiring speakers to hear and encouraging activities in which to take part! Spread the word: NMI Convention is for everyone ~ not just delegates and NMI Presidents! Put it on your calendar. Bring a group from your church. Celebrate what God is doing in our local communities, as well as around the world through Nazarene Missions International. How about that! Jesus never spoke to the crowds without telling them stories. With that in mind, we made an effort to advance the concept of telling Bible stories to our pastors, teachers and small group leaders during this past church year. It’s my greatest hope that a large number of our people will feel confident in telling Bible stories as effortlessly as they can recite children's stories they heard and repeated long before they learned to read. In ministries to come in this new year ahead of us we are in the process of putting together ideas for three separate ministry efforts. One will be a ministry that will strengthen marriages and families, and by doing that we hope to build stronger churches. Another idea we discussed is targeted toward helping pastors work from their strengths by using Strength Finder. The biggest challenge in this idea is financing it within our budget. Finally, perhaps my personal favorite idea is a ministry that will help our local churches develop GREAT Children’s Ministries, including highly motivated workers. This is an ongoing process, but I am hopeful we can make this a reality in many more of our churches. I highly value your prayers in these three endeavors. Each of them will build a stronger local church andcommunities will benefit from these three endeavors. God wants to continue to do some great things in our lives, and in His church. I was reminded recently by a comment from John Piper how this happens. He writes, “One of the signs that God is going to do a great work is that he begins to stir up his people to pray for it. He lays a burden on a person here and a person there. He brings it back to their mind again and again. It stalks them. It drives them to their knees. Or it catches them on their knees. Daniel serves as a contracted specialized assignment missionary for the Church of the Nazarene at JESUS Film Harvest Partners. He helps to facilitate the work of over 440 teams of nationals working around the world to share God’s love with the lost. Departing from Garden City, Kansas, forty-one children flew to Africa, Papua New Guinea and Mexico on 'AirNaz Airlines' on February 12. The flight crew, tour guides and sponsors helped children travel safely with passports, tickets and luggage to all countries where they learned how Jesus Christ is being shared through the Church of the Nazarene. The overnight adventure was successful as no passengers were lost and fun was had by all. Thank you to all who attended and helped share with our District children how Missions is building relationships and sharing the Good News of Jesus. One of our great pastors (and we have many on our district), Darrel Riffle, told me that he is praying for 100 souls to find Christ and be baptized by the end of the summer. He and Cheri are actively praying, planning and stepping out in faith. He is inviting us to pray with them. They are relaunching the restart of LarNaz on the first weekend of March. Let’s all be praying for God to grant them favor and power to accomplish the vision. On February 20, they will be walking the streets of Larned, praying and inviting many to join them in church during the Easter season. Also, I am delighted to tell you that Caleb and Julia Miles will be joining the team in Goodland, Kansas. Caleb will begin pastoring the Goodland Church beginning February 21. We will be working with them to restart the church in Goodland. The members of Goodland have been so patient and praying for a godly leader. We believe good days are ahead as we work together to building the kingdom there. Keep praying the 10:02 prayer! Luke 10:2 tells us, “The harvest is plentiful, but the workers are few. 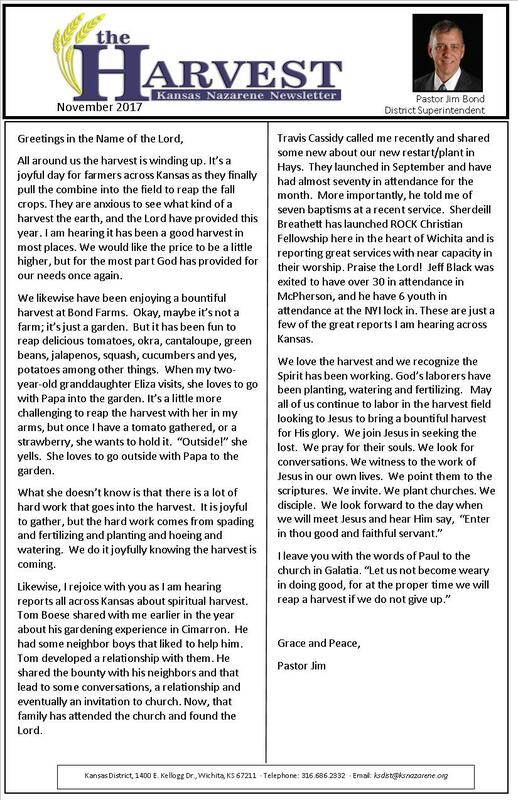 Ask the Lord of the harvest, therefore, to send out workers into his harvest field.” We need to be praying for vision and power just as the boss of the church asked us to. Children's Mission Retreat February 12-13, 2016 Created for 4th-6th graders, this exciting overnight adventure will help children see what Jesus is doing around the world through the Church of the Nazarene in three different countries. Each child will receive a personalized passport and tickets to travel on Air Naz to Africa, Papua New Guinea and Mexico! Sponsored by your Kansas District NMI Council. For information and registration, click on the Children's Mission Retreat tab on the web site. Registration deadline is February 10. 100th Anniversary NMI Project Thank you to all who have participated in taking an offering for the 100th Anniversary Project for African Water Wells. If you have not taken an offering yet, there are English and Spanish posters and videos available for you as a resource for promoting the building of thewater wells. Missionary Speakers Daniel & Julie Herrera, missionaries with JESUS Film Harvest Partners, will be on deputation tour March 12-20, 2016. Check the website for church locations, date and service times next month. Under the tab Speakers are a list of possible presenters for Faith Promise, missionaries and leadership training. Mission Trip Opportunities There are several trip opportunities listed for your church to get in touch with and start planning an incredible trip! Some sign-up deadlines are due soon, don't miss out! Facebook Check out our Facebook page (Kansas District Nazarene Missions International) with current, relevant posts that encourage the heart and share Nazarene news from around the world. Thank you for serving Christ where you are and wherever He is leading you.